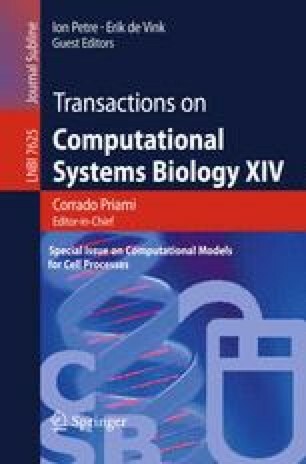 We formalise a continuous-time Markov chain with multi-dimensional discrete state space model of the AKAP scaffold protein as a crosstalk mediator between two biochemical signalling pathways. The analysis by temporal properties of the AKAP model requires reasoning about whether the counts of individuals of the same type (species) are increasing or decreasing. For this purpose we propose the concept of stochastic trends based on formulating the probabilities of transitions that increase (resp. decrease) the counts of individuals of the same type, and express these probabilities as formulae such that the state space of the model is not altered. We define a number of stochastic trend formulae (e.g. weakly increasing, strictly increasing, weakly decreasing, etc.) and use them to extend the set of state formulae of Continuous Stochastic Logic. We show how stochastic trends can be implemented in a guarded-command style specification language for transition systems. We illustrate the application of stochastic trends with numerous small examples and then we analyse the AKAP model in order to characterise and show causality and pulsating behaviours in this biochemical system.